The cloudless sky was interrupted by a skyline of what appeared to be snowy mountains. 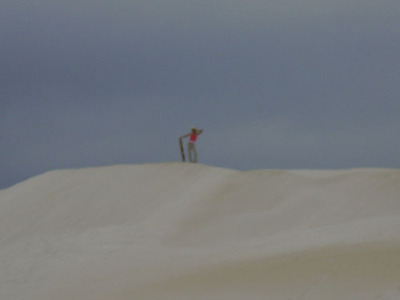 I was in disbelief as my friend, a Perth local told me they were sand dunes. With our little buggy loaded with sand boards, cowgirl hats and a camera, we were ready for an adventure. On my first holiday to Perth, I felt as though I was no longer in Australia as we began our climb in the pure white sand. Puffing and excited, we climbed, boards under our arms. Dodging other sand lovers and watching out for giant tour beasts diving over the dunes with tyres the size of a house, we finally made it to the top. I look so tiny up there! The adrenalin pumping through my veins made it impossible for any fear to hold me back as I dived onto the sand board and sped down my very first dune. Flying clean off with a mouth and eyes full of grains of sand, I returned to my feet and tried again. It took a couple of tries before I met with the foot of a giant mountain of sand without tumbling hopelessly. It wasn't just the fun of the sand boarding that made this adventure unforgettable. The sand dunes seem to go on forever, the view from the top is sensational. And houses are nestled amongst these giants like cottages in a snowy mountain village. Lanecelin is about an hour and a half drive north of Perth approx 94 kilometres). 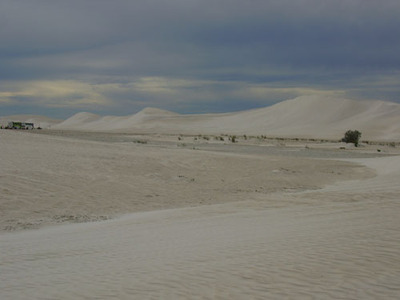 The Sand Dune Valley is about two kilometres long. Dune buggy racing in the sand dunes is a popular recreational pastime. Lancelin is home to fun loving dolphins daily. The township offers plenty of cafes and accommodation. Why? This place is seriously cool.